Help your students organize their writing with venn diagrams, story maps, and more. Your kids can use the writing webs, chronological order charts to improve the organization of their writing. 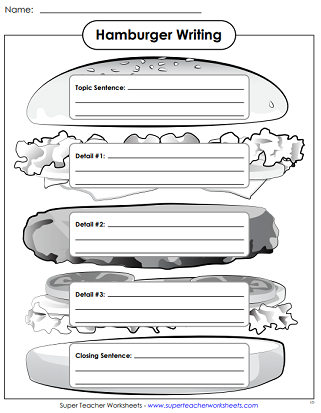 Use the hamburger organizer to design the perfect paragraph. The main version has lines to write on. If you'd like a version without lines, click the "Alt" button below. Here's another hamburger paragraph writing organizer. This version has lots of space to write the topic sentence, details, and closing sentence. If you'd like a color version, click the "Alt" button below. This is yet another version on the hamburger writing activity. This organizer has the hamburger parts spread out. If you'd like to print this worksheet in full-color, use the "Alt" button below. Main idea or topic sentence goes in the middle. Supporting details go in the petals. Same paragraph-writing flower as above, but this version has lines for writing. Write the main idea on the robot's body. The details go on his arms and legs. Students organize their writing by putting their details in the ice cream scoops. Yum! This organizer will help students plan their persuasive writing essays. There are boxes for opinion, reasons, and details. There's also a special box for a counterargument. This is the same worksheet as above, except this version has lines in the boxes on which students can write. This web has a circle in the center for main idea and four large circles for supporting details. This web contains six sections for supporting details and one main topic section in the middle. This web has 9 sections - one for topic and 8 for details. On this web, students write a their topic in the center box. On the outer spokes/boxes, they describe observations that they see, hear, smell, touch, and taste. On this web, students will choose a topic and then write about how they observe the topic with their 5 senses. Students can use this large Venn Diagram to compare and contrast. There's plenty of room for writing. This Venn diagram includes lines for writing. Students record observations on this column chart. 5 columns: see, hear, smell, taste, and touch/feel. A simple, printable t-chart with lines for writing. This t-chart does not have lines for writing. Another t-chart. This one has numbered lines. Concept wheel with spaces for topic and 6 details. Concept wheel with spaces for topics and 8 details. Setting, characters, beginning, middle, and end. Setting, major characters, minor characters, main problem, solution. Draw two characters. Then tell how they are alike and different. Draw two characters. Tell what they do, say, and feel. Make a 6-panel sequencing film strip. Then cut it out and scroll the frames through a paper monitor. 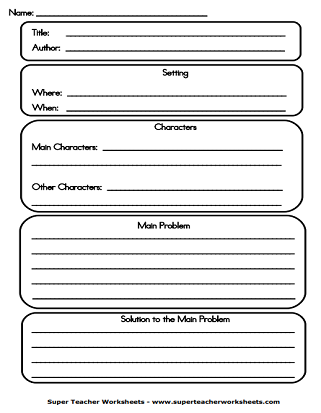 Write events in order on this graphic organizer. This version does not have lines for writing in the boxes. Write events in order on this graphic organizer. This version has lines for writing in the boxes. On this K-W-L chart, you can write about what you know, what you want to know, and what you've learned. Same chart as above, but this version does not have lines on it. On a K-W-H-L chart, you write about what you know, what you want to know, how you can find information, and what you've learned. Same K-W-H-L chart as above, but this version does not have lines on it. This basic relationship tree has one main category that splits into two subcategories. This intermediate relationship tree has one main category that splits twice into subcategories. 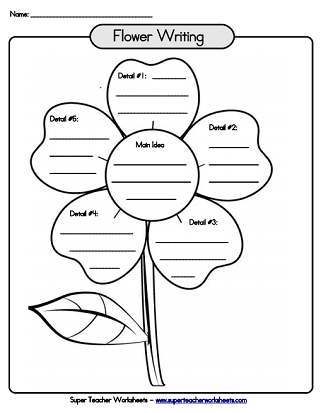 This worksheet includes a blank relationship tree organizer and an example. This advanced relationship tree has one main category that splits three times into eight subcategories. This question-mark-shaped graphic organizer has spaces for students to record who, what, where, when, and why. This web has boxes with the words who, what, where, when, why, and how. Practice basic writing skills with these writing worksheets. Printable timeline graphic organizers and timeline comprehension worksheets.